Flame angelfish larvae (Centropyge loricula) were raised from captive-spawned eggs at 77-79F on wild copepods and artemia. The larval duration was 85 days. The Flame Angelfish is arguable the most common and well known pygmy angelfish species in the trade. It is more omnivorous than most other pygmies (which are primarily herbivorous) and considered very hardy in captivity. This species prefers water temperatures between 77 and 82º F. It occurs from Palau to the Hawaiian Islands. It is usually collected for trade in the Christmas and Marshall Islands. Adults reach a maximum size of 4.5 inches. Left: A pair of Flame Angelfish (male on right). Right: A 90-day-old Flame Angelfish juvenile. The Oceanic Institute first raised C. loricula in 2002. 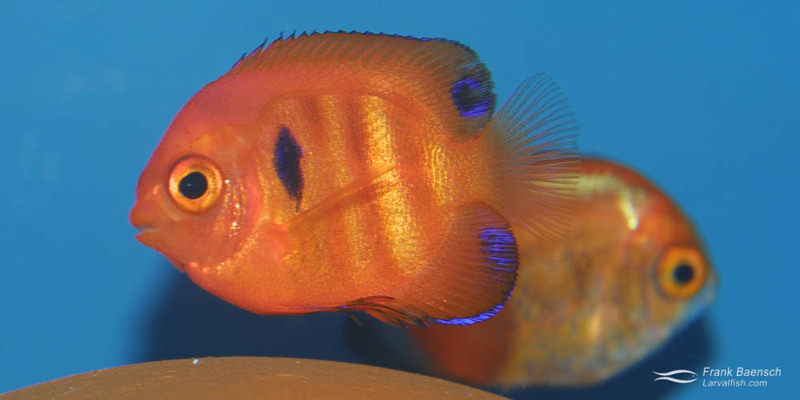 Pacific Planktonics (Syd Kraul) has been producing C. loricula for the aquarium trade since 2004.